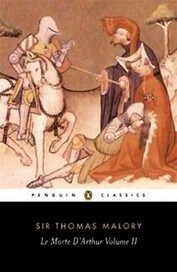 Edited and first published by William Caxton in 1485, "Le Morte d'Arthur" is Sir Thomas Malory's unique and splendid version of the Arthurian legend. Mordred's treason, the knightly exploits of Tristan, Lancelot's fatally divided loyalties and his love for Guenever, the quest for the Holy Grail; all the elements are there woven into a wonderful completeness by the magic of his prose style. The result is not only one of the most readable accounts of the Knights of the Round Table, but also one of the most moving. As the story advances towards the inevitable tragedy of Arthur's death the effect is cumulative, rising with an impending sense of doom and tragedy towards its shattering finale.